Kremlin-controlled news media outlets regularly lambast what they call “the wild 90s” as a time of personal humiliation and shameful national weakness. All the abuse, however, has been an unexpected boon to the Boris Yeltsin Presidential Center, a shimmering shrine on the edge of Siberia to Mr. Putin’s reviled predecessor and his turbulent years in power, from the 1991 collapse of the Soviet Union to the end of 1999. The torrents of scorn poured on Mr. Yeltsin and his era by the Kremlin’s cheerleaders has given the complex an edgy appeal, helping it attract more than 700,000 visitors since it opened three winters ago. It has become perhaps Russia’s most popular and certainly its most lavishly equipped outpost of alternative history and against-the-grain thinking. On the surface, the complex — set next to a lake in the center of Yekaterinburg, the industrial city where Mr. Yeltsin lived for much of his life and where Czar Nicholas II and his family were murdered by the Bolsheviks — is a showcase for how Russia has changed for the better under Mr. Putin. It is shiny and modern, efficiently run and brimming with high-tech flourishes. One exhibit features puppets from a satirical television show that, in the 1990s, skewered Mr. Yeltsin and his officials mercilessly. The show was canceled by Mr. Putin, who took umbrage at his representation by an ugly, dwarfish puppet. The once private television station that broadcast the weekly show, NTV, is now controlled by the state and serves as a bullhorn for Kremlin propaganda. Western-oriented liberals mostly view Mr. Yeltsin as a brave, if deeply flawed, hero who rallied resistance to an August 1991 putsch by Communist Party hard-liners, broke the back of the Soviet Union, introduced capitalism and gave birth to Russia as a free and democratic nation. Nationalists and leftists, though, remember him as at best a vodka-soaked buffoon and at worst a traitor working for the West. “Putin’s P.R. team has reduced everything to the contrast between images of a young, dynamic Putin and an old, alcoholic Yeltsin,” said Yevgeny V. Roizman, a Kremlin critic who resigned last summer as the elected mayor of Yekaterinburg in protest at the abolition of mayoral elections in the city. 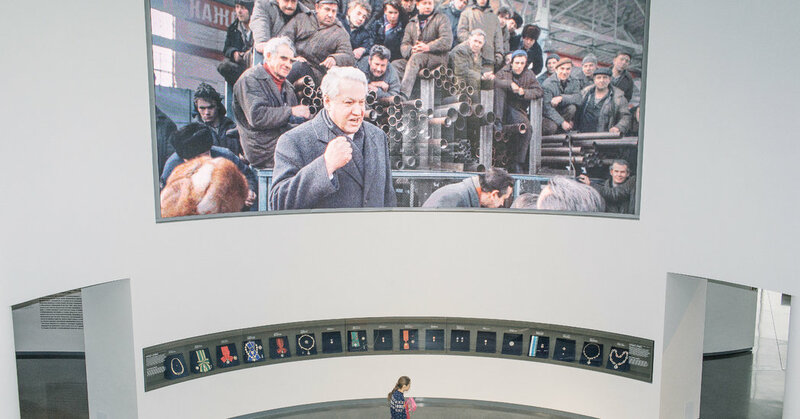 The center’s goal, said Dina Sorokina, the museum director who is a graduate of New York University, is not to whitewash Mr. Yeltsin, though it does largely ignore some of the more odious features of his rule, notably the emergence of so-called oligarchs through corrupt privatization deals. “The goal is not hagiography but an attempt to understand that time and also where we are now,” she said. The silence about Russia’s oligarchs is perhaps explained by a list of donors at the entrance. It includes billionaire tycoons like Oleg Deripaska and Roman Abramovich, both of whom made their fortunes in the 1990s. Also named as a donor, curiously, is Mr. Putin, who attended the opening of the museum, along with Mr. Yeltsin’s widow, Naina. “He was like a mummy,” Mr. Drozdov said. The Kremlin’s blessing for the project, said Mr. Roizman, the former mayor, flowed from a contradiction at the heart of Mr. Putin’s rule. While he has undone much of Mr. Yeltsin’s legacy, particularly in politics, he came to power thanks to Mr. Yeltsin. “Putin owes Yeltsin everything,” Mr. Roizman said. Mr. Putin, who has always placed a premium on loyalty, never attacks Mr. Yeltsin personally. But he has given state news media outlets free rein to attack his predecessor’s legacy with gusto. Mr. Yeltsin, who was born near Yekaterinburg and governed the city as Communist Party boss in the 1970s, died in 2007 at age 76. But he still looms large in Russia, even if mostly as a punching bag for Mr. Putin’s cheerleaders on state TV and as a hate figure for many ordinary Russians, who blame him for the demise of the Soviet empire and for plunging the country into poverty and disorder. Mr. Putin often plays on public nostalgia for the Soviet Union and regularly boasts of ending the economic misery and political chaos of the 1990s. The center, though, offers a starkly different view of the past. It greets visitors with an animated film celebrating Mr. Yeltsin as Russia’s first leader in more than a millennium to break a grim cycle of bloody tyranny punctuated by brief spurts of failed reform. In addition to the permanent exhibition feting Mr. Yeltsin and the freedoms he introduced, it also hosts seminars, debates and cultural events that stray far from the monochrome, muscular patriotism promoted by the Ministry of Culture in Moscow. As Mr. Putin’s rule, now already twice as long as Mr. Yeltsin’s, drags on, grim memories of the 1990s are perhaps brightening a bit as faith in Russia’s current course dips. That the public is not entirely convinced by the image on state television of Mr. Putin as Russia’s savior is clear in the often empty halls at a rival museum in Yekaterinburg, where an exhibition on “Russia: My History” gives a highly nationalistic recounting of the past. It presents the 1990s as a period of unrelieved misery and Mr. Putin’s time in office as an era of prosperity and national rebirth. Despite being heavily promoted by state media outlets, the museum was empty of visitors last week except for schoolchildren on a field trip. The most virulent critics of the Yeltsin complex have been grandstanding celebrities like Nikita Mikhalkov, a filmmaker who thrived under Mr. Yeltsin’s presidency but has since recast himself as a great Russian patriot and Putin loyalist. The denunciations have only helped keep up public interest. Andrei Pirashkov, a 23-year-old communist who was elected last year to the City Council in Yekaterinburg, said he was no fan of Mr. Yeltsin but often visited the center for its lively seminars and public debates.